Black cutworm moths have dark brown forewings, light-coloured hind wings, and a wing expanse of 38 to 51 mm. Granulate cutworm moths have yellowish-brown forewings and a wingspan of 38 to 45 mm. Variegated cutworm moths may be yellowish or brownish with a wingspan of 38 to 50 mm. Cutworm eggs are white and usually laid singly or in small clusters. Variegated cutworm eggs are generally laid in elongate patches. Black cutworm larvae are dark greasy grey to black with a light coloured line down the centre of the back. They are 38 to 45 mm long when mature and the skin is covered with smooth black granules. Granulate cutworm larvae are dusty brown with a more roughly granulate skin and 25 to 38 mm in length. Variegated cutworm larvae have a distinct pale yellow dot on the mid-dorsal line of each segment. About 50 mm long when mature, they are pale dirty brown in colour. 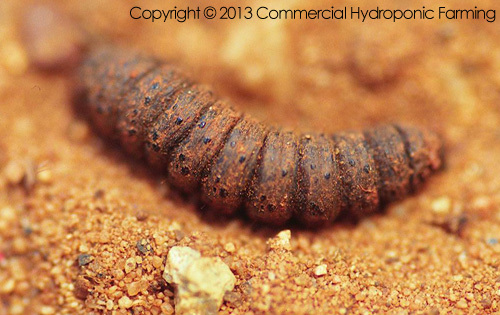 Cutworm pupae are about 20 mm in length and dark brown or mahogany in colour. Several species of cutworms may injure vegetable seedlings and newly set plants in the field. Larvae hide under clods and in cracks in the soil by day and appear at night cutting off young plants near the ground and feeding on the foliage. The black cutworm is one of the most destructive cutworms. One larva often severs numerous seedlings in a row during a single night. Small populations can cause considerable injury resulting in the need to replant. The granulate cutworm and the mature variegated cutworm also sever plants. Early instars of the variegated cutworm, however, climb plants and feed on the leaves. Cutworms pass the winter as larvae or pupae. In early spring, larvae which have over wintered resume activity and feed until they are mature. Pupation then takes place in the soil. Moths emerge from pupae 2 to 4 weeks later. Soon afterwards, females begin depositing eggs at night in clusters on the undersides of leaves. Each female lays hundreds of eggs. Under favourable, warm conditions, eggs hatch in 3 to 5 days. Young larvae may feed on leaves, but larger larvae are most commonly found in the soil around the bases of plants. After feeding for 3 to 4 weeks and developing through 5 to 8 instars, larvae pupate in the soil. A new generation of moths soon emerges. Most cutworms complete 3 or 4 generations per year. Since extensive damage may occur in a short period of time, plant beds and newly set plants should be inspected frequently. A bait may be used in infested plant beds or on newly set plants in the field. For up-to-date control recommendations, consult a specialist in this field.